So my POS AAA battery that came in my 8 is finally dead. I want to throw a lighter battery in there and was wondering which would really be the best choice. I have seen mention of a few different ones(Odyssey PC680 battery, Braille, etc.) in and out of other threads. I am wondering what spec I am looking for or which would be the best choice, since during my search I found mention of needed a decent amount of CCA for the RX8 over other vehs. It will be staying in the engine bay, so it needs to be Lead Acid/AGM due to heat. It is my daily and I will be putting a battery tender on it too, as that will most likely be needed. Any help would be great as currently the car is dead, so I need something soon. Last edited by Tofu*Monster; 06-06-2015 at 11:33 AM. After trying to compare a few it looks like the CF versions are just cosmetic, there are similiar specs and weights from the normal Braille series. I run a PC925 relocated to the trunk. It is not the lightest battery but it is a lot lighter than the one I had and it performs well. The smaller ones are a PIA IMO on a street car. My buddy also runs the PC925 and Hoss-05 runs the Odyssey 35-PC1400T but you don't save much weight there. You can save all the weight you want, but your car cranking like a '67 VW beetle is embarrasing. Sweet setup 9k, I just don't want to relocate. I tried PC690 and it worked fine. However, it is easy to drain the battery if you dont use the car often or leave the key in the ignition for too long, etc. Best to keep it on a trickle charger when not in use. These batteries do not like the heat so best to get the battery relocated. My battery is relocated and it makes it so much easier to work under the hood. There's also space to store frozen foods so they thaw out pretty quickly. That and the end result was also covered. Thanks, I plan on some slight changes to clean it up a bit but it has worked great so far. Texas heat + turbo rotary plays hell on batteries so this was a must for me. Yeah I don't know why I didn't do this years ago. Even with a properly thought out setup it is very easy to do. I'm running PC680 in the same battery location. As relocation of the battery to the trunk will disqualify me from RWD street-class time attacks. Cranks well, but if the battery is connected and you don't move the car for 2+ days, the battery will be drained. Anti-gravity Lithium Battery will be a good alternative. Well my battery died last week, a few days before I was heading to the track... Tirerack had free next day shipping to my zip on a 17 lbs lightweight racing AGM Braille battery so I went for it. Would have picked the 21 lbs version, but was not in stock. Fit into the stock box rotated 90 degrees (so snug left and right, but space in front and behind). Used the included J-hooks (as they have more thread which is needed to get lower), the factory metal clamp, and cut the sides of the box a little so I could route the cables to the lower battery posts. Works like a champ and did not budge while pulling as much as 1.4G under braking and through the turns. Will see how it lasts. I guess I am looking at $200 every 1-2 years, rather than $150 every 5-7 years, plus needing to charge it, or at least leave it disconnected when I don't use the car for more than a couple of days. That seems a reasonable price to me to take ~19lbs of lead off the nose of the car. Since the battery box is still basically stock, another option would be to pick up a full sized battery for daily use, and just swap in the Braille for track or auto-x weekends. I already swap wheels and brakes, but will see how this one holds up before going down that path. Last edited by blu3dragon; 09-08-2015 at 11:29 AM. Many Braille batteries are just over-priced, relabeled Dekas (though they swear they are not). Buy the Deka instead and save money. Also they should last 5-7 years easy or you are getting garbage batteries or not maintaining them (allowing them to discharge). When you are not using the car, get an intelligent battery maintainer. Or a solar charger if you don't park in a garage/near an outlet. The 2 Amp Schumacher maintainers can be had for $25 from Wally World. There are "AGM-specific" battery maintainers that don't hurt, but they are not required unless you use crap AGM batteries (*cough* Optima *cough*). ^good to know, thanks. I needed one in a hurry and so did not do much research. I think I actually paid 180. It does look the same as the Deka and that would be much cheaper! If I get 5 years out of mine, then I will be pretty stoked. Thank you for the info guys now I'm looking at getting a Deka, quick question though has anyone every played around with some sort of insulation for the battery so it does not get as heat soaked? Last edited by hufflepuff; 03-24-2016 at 01:57 PM. I use a U1R tractor battery. I've used this battery in 3 other cars as well for multiple seasons. Starts fine down in the 30F range. weighs about 18ish pounds. really - this little $20 230cca job? I'm surprised the alternator isn't cooking the smaller capacity batteries. What kind of life do you get out of the battery since it likely deeply discharges during an RX-8 start. The diehard is rated at 340 CCA. spend more to get the higher rated CCA versions. I've had one in my integra NASA time trials car for 3 years going strong. Had one in the RX8 for about 6 months now. turns over the engine fairly strongly. engine cranks right up on cold mornings. I know it seems small, but my integra, RX8, and old eagle talon never had issues starting under any circumstances. you'll find plenty of autocrossers using batteries such as this one, or smaller. If you have low compression, maybe it's a different story since you need all the cranking power you can get, but for a reasonably healthy engine I've had great results. I've also let the car sit for about a week and it fired right up. Last edited by hufflepuff; 03-24-2016 at 02:00 PM. 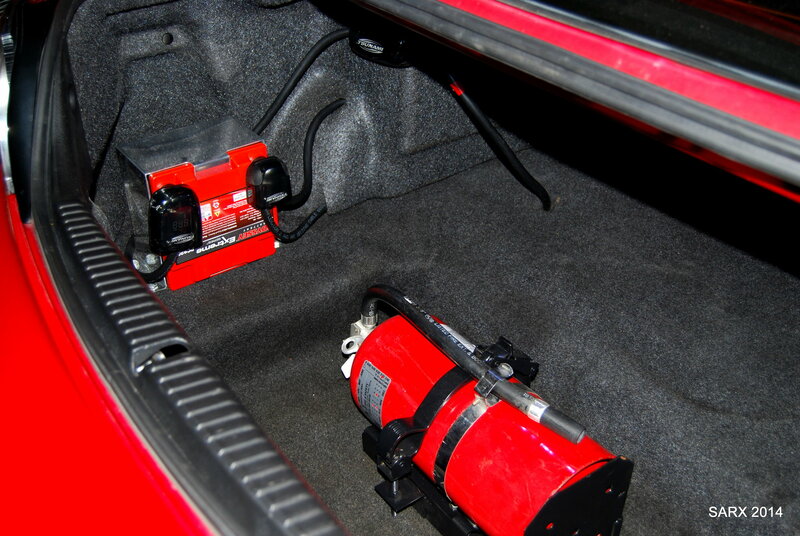 Alternators are set to put out a specific voltage and to not overcharge the battery. they don't mindlessly keep pushing current. in addition, cranking at 300A for 10 seconds removes less than one amp-hour, while the battery contains more than 30amp-hours, so you could do plenty of start attempts.